Start Reading - Will Your Dog Reincarnate? Have you lost a beloved pet? Wouldn’t it be wonderful if your dog – or cat, or other companion animal – could somehow come back to you? Wouldn’tyou give just about anything to hold him (or her) in your arms again? It can happen. It is happening. Every day, people like you are being reunited with a cherished dog or cat. I know, because I’m one of them. My beloved Bao came back to me. He’s sitting at my feet as I write this. You don’t have to be a mystic or a psychic for this to happen to you. (I’m a retired Professor of Management) You don’t even have to believe in reincarnation. But you do need an open mind. When human beings reincarnate, they are reborn as infants and therefore cannot resume the relationships they enjoyed in previous lives. But dogs are different. Because their life span is so much shorter than ours, our dogs can and do return to us. Of course, not all dogs return to their owners. When they do, it is because a special bond exists between that dog and that person, a karmic bond that transcends death. Do you and your dog share this kind of special bond? Probably you do. You are reading this book because you are meant to read it. Some dogs find their way back on their own. But usually, it’s a joint effort. The first – and perhaps most challenging step – is realizing that you are a vital part of the equation. You are more powerful than you think. Everything you think and do and say makes a difference. 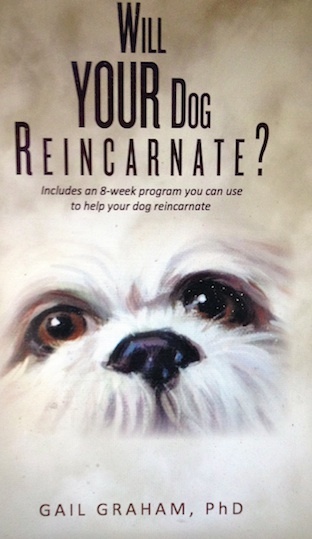 So what should you be thinking and doing and saying if you want your dog to reincarnate? Basically, all you need to do is reach out to him and let him know that you love him, miss him and want him to come home. Love isn’t complicated and neither is reincarnation. There are many things you can do to help your dog find his way back to you. None of these things are difficult. On the other hand, it isn’t merely a question of following a map, or a set of instructions. Every dog is different. Every owner is different. Every relationship is different. You must trust yourself, especially your instincts. We live in a world of facts and data, and we expect things to make sense. But sometimes, they don’t. Knowing and believing are two very different things. You’re accustomed to trusting what you know. Now you must learn to trust what you believe. Accepting what you don’t understandcreates a universe of limitless potential, where anything can happen. Does it all sound a little bit crazy? In a sense, it is. It involves losing your mind – your rational, critical, reasoning, analytical left brain. It involves believing, rather than knowing. Your mind is important, but you are not your mind. You are something else, something bigger. Albert Einstein said: There are two ways to live your life – as if nothing is a miracle, and as if everything is a miracle. My family was gone and Bao was all I had left. We were inseparable, and we’d been through so much together. Friends worried. If anything happened to Bao, how would I handle it? Bao was my whole life. He was eleven when he got sick. He wouldn’t eat, and over several weeks, he lost nearly a quarter of his body weight. He became so weak he could hardly stand up long enough to pee. His tests results were inconclu- sive and nobody could figure out what was wrong, but our wonderful veterinarian Dr. Mike Soltero somehow pulled him through. Just when we thought he was out of the woods, he experienced a pericardial effusion, a buildup of fluid in the sac that holds the heart. The fluid was drained, and sent away for testing. The results were negative for cancer. It can happen once and never happen again, Dr. Mike told me. But six weeks later, it did happen again. And again, four weeks after that. Something was verywrong. More tests were ordered and this time, the fluids tested 90% positive for a rare and very aggressive type of cancer that didn’t show up on scans or ultrasounds. Meanwhile, the pericardial effusions had become weekly occurrences. Something had to be done. The most common treatment – and the most effective, when the underlying cause isn’t cancer – is a surgical procedure to cut a “window” in the pericardium which allows the accumulated fluids to drain into the pleural cavity, where they are more easily reabsorbed. Mercifully, Bao wasn’t in any pain. Except for the fact that he tired quickly, you wouldn’t know anything was wrong with him. He was his usual, happy little self, living his happy little life. I put off the surgery for a few weeks, hoping the pericardial effusions might go away as quickly as they’d appeared. But they didn’t. On the advice of both Dr. Mike and Bao’s cardiologist Dr. Chris Paige we drove to the Colorado State University Veterinary Hospital in Fort Collins for the procedure. Bao was delighted. He loved car trips. He loved motels. He loved traveling. The night before his surgery, I gave him a special dinner, with bones. Right up to the moment they sedated him, he was enjoying his life. around his little cage. I’d brought one of his soft toys along, and he curled up on top of it and drowsed off. The next 24 hours were critical, I was told. Go back to your motel and get some rest. We’ll call you if anything goes wrong. The telephone rang at midnight. It was Dr. Lana, who was overseeing Bao’s care. Bao was in cardiac arrest. They were working on him, trying to bring him back. It isn’t good, said Dr. Lana. You’d better come. I drove frantically through the dark, unfamiliar streets. I even ran a red light – the first time in my life I’ve ever done that. I was in the hospital parking lot when my cell phone rang. It was Dr. Lana. I’m sorry, she said. He’s gone. I was too late. I couldn’t even say goodbye. Dr. Lana led me through darkened rooms and silently swinging doors to the hospital section. It had all happened so quickly. I was stunned, numb with shock. “Is there anyone you can call?” Dr. Lana asked. It was just past midnight. I called my friend Jeannie, in Scottsdale. I knew she’d be there for me, despite it being the middle of the night. And she was. She picked up before the second ring. It was almost as if she knew. They let me hold Bao for nearly an hour. He was still warm. He might have been asleep. The doctors were crying, and I was crying, too. Dr. Lana kept saying, This is the last thing that anyone expected. They let me cutoff a lock of his hair, and we made a plaster impression of his dear little paw. And then I went back to the motel, without him. Bao is gone. The doctors said this was the last thing anybody had expected – that’s why they didn’t have me come in earlier. He was coping and then suddenly his heart stopped, without warning – he was hooked up to monitors, there was no arrhythmia, his heart just stopped. And they couldn’t bring him back, no matter how hard they tried. Oh, Bao – I love you so much, we shared so much, we had so many good times If I’d got there in time, could I have called you back? I undress and creep back into bed. After I turn out the light I just lie there, staring into the darkness, still dazed. That’s when it happens. That’s when I know Bao is coming back to me. He is dead, yes. But he will be reborn, his loving soul in a new, healthy body. He is coming back to me. He is already on his way. I don’t hear a voice. I don’t see an image. There is no clap of thunder, no burning bush. It’s like a whiff of incense or a shooting star that you can only see out of the corner of your eye, something you might easily miss if you’re not paying attention. I feel it viscerally, although it only lasts for an instant. Then it’s gone. But whatever it was, I know it was real. There is no doubt in my mind about that. Bao is coming back to me. Now I feel as if I’m in the eye of a storm, where the sky is blue and the sun is shining and the storm itself seems impossible. Bao’s death is impossible. It’s a bad dream. It didn’t happen. When I wake up, he’ll be here beside me, just as he always is. I close my eyes. And he is beside me when I wake up. Not physically, of course. Bao is gone, I know that. My eyes are red and swollen. I must have been crying all night, even in my sleep. I feel terrible, terrible pain, unbearable loss. Yet I also feel Bao’s spirit trying to comfort me, I feel his psy- chic presence. He is dead, yes. But somehow, he is also here in bed with me. I was twelve in 1953, when Morey Bernstein hypnotized Virginia Tighe at a cocktail party. It was supposed to be a joke. But under hypnosis Tighe – to everyone’s amazement – described her former life in Ireland as Bridey Murphy, a woman who’d lived 200 years earlier. Bernstein wrote a book about it, the book became a best seller and Life magazine called the subsequent craze for ‘parlor hypnosis” that swept the United States a “hypnotizzy”. People threw “come as you were parties” and my mother was convinced that in her former life, she’d been Princess Anastasia. To me and my friends, reincarnation made as much sense as anything else. It was certainly no more incredible than atomic bombs, television and flying saucers. Although I eventually ceased to believe in themonotheistic deity to whom I said my nightly, childhood prayers, I’ve never seen anything intrinsically unreasonable in the concept of reincarnation. Everything in the universe follows a cycle of birth, death and rebirth. Why should we be an exception? I don’t remember any of my previous lives. But most people don’t, and I’ve always been unremarkable, parapsychologically speaking. Angels don’t talk to me. I see no visions. I hear no voices. In shamanic drumming circles, I’m the one whose animal guide doesn’t appear. Yet I remain a Mulder, rather than a Scully. I want to believe. And I do believe I’ve lived other lives, even if I don’t remember them. I believe we are all part of a gigantic, timeless, cosmic dance in which everything in the universe is connected to everything else and everything we do – or fail to do – in each of our many lives makes a difference. Feelings become thoughts, thoughts become actions and actions become destiny. I believe that at every moment, each of us is changing everything for ourselves and everyone else. Believing is one thing, but living one’s day to day life is something else. Certainly, my belief in reincarnation was of no comfort to me when my husband Rollyn died. I knew that in this lifetime Rollyn and I would never again be together as husband and wife, and reincarnation couldn’t change that. Yes, we’d probably meet again in some future life, but what good was that? This was different. Bao was coming back to me, in this life. I knew it as surely as I knew it was Friday morning and that I was sitting on a bed in a motel room in Fort Collins, Colorado. Was I simply using a psychological defense mechanism to protect myself from unbearable grief? That’s what some people might say. But I disagree. Psychological defense mechanisms are supposed to protect you from pain, and I was in terrible pain. I was heartbroken, overwhelmed by grief, despair, and loss. Knowing that Bao was coming back to me did nothing to ease the heartbreak of having lost him. That might not make sense, but that’s how it was. I had to return to the hospital before I went home. I needed to pay the bill, and I also had an appointment with Veterinary Hospital Clinical Coordinator Gail Bishop, who’d offered me so much encouragement and support yesterday. Was it only yesterday? A part of my mind still will not accept what has happened, or that Bao is gone. And in a sense, he isn’t gone. When I open the car door, I feel him jump in – just as he always does – and curl up on the passenger seat. Yesterday, I’d told Gail I couldn’t imagine a life without Bao. Not surprisingly, she is now concerned about me. She is even more concerned when I tell her I’ve decided to start back to Scottsdale immediately. I’m as astonished as they are. I can’t believe I’ve said such a thing out loud. Their expressions don’t change. They don’t disagree, or even argue. Of course, I think, they’re professionals. This is a veterinary hospital. They’re having to deal with this all the time. Animals come here because they’re hurt or sick, and some of them don’t make it. Most likely, they think I’m in denial. That’s the first stage of the grief process – denial. But I know Bao is gone. I know he is dead. I know I will never feel his warm little body snuggled against me again, never feel the warm rasp touch of his tongue on my face, never watch him joyously work a bone. Just hours ago, I held his motionless little body in my arms, and felt the warmth slowly leave it. No, I am not in denial. I’m not angry, either. (Anger is the second stage of the grief process) Everything that could be done was done. Thankfully, money had not been an issue. He’d had the best. I have nothing to reproach myself for. There is nothing more I could have done. There is nothing more any of the many doctors could have done, either. If anything, I feel gratitude towards all the kind and dedicated people – in Scottsdale and here in Colorado – who worked so hard and cared so much. Bargaining is the third stage of the grief process. So am I bargaining? Am I telling myself that it’s okay for Bao to be dead so long as it’s only temporary? I think about this, walking across the hospital parking lot to my car. But it doesn’t feel right. I’m not bargaining. Besides, knowing that Bao is coming back does not mitigate the unbearable pain of having lost him. It’s nearly noon before I begin the long drive back to Scottsdale. Bao’s leash and harness are on the passenger’s seat next to me, where Bao should have been. But Bao is gone. And yet, he isn’t. He is here with me, in the car. Not physically, of course. But his soul, his spiritual essence, is still very close and very real to me. I know he is physically dead, but I also know he was with me in the motel room just now, watching as I packed our things, accompanying me to the car, and then hopping in beside me. He isn’t a ghost, although I know people sometimes believe they’ve seen their dog’s ghost, especially in the first days after death. Every morning until the day hedied, artist Murray Urquhart’s dog Judy jumped onto his bed and barked – even though Judy herself had passed away 35 years earlier. These things happen. But I can’t see Bao, not the way Murray Urquhart saw Judy. I can’t hear him, either. His presence is just that – a presence. Years ago my husband and I spent four weeks in Europe, having left our beloved Dalmatian puppy Rosie at a boarding kennel. One morning in Paris, she was suddenly there in the bed with us. Not as a ghost, but as a palpable – although invisible – presence. We were puzzled. But this was before the days of internet, and it was only when we returned home that we learned she’d died suddenly and quite unexpectedly of massive kidney failure caused by a previously undetected congenital defect. The time of her death corresponded exactly with when we’d felt her there in bed beside us. Bao’s psychic presence resembles Rosie’s, but it’s much stronger. I can feel him here on the seat next to me, as real as my own body and being. He is already on his way back to me. I know it. I can feel it. Yet I’m not comforted by this knowledge, not at all. I can’t imagine how I am going to manage without Bao. I don’t want to manage without him. I don’t want to live without him. It takes 15 hours to drive from Fort Collins to Scottsdale. South of Denver I drive more or less mindlessly. The road is long and straight and there isn’t much traffic. Moving in air-conditioned solitude and silence through mile after mile of empty Colorado highcountry, I slip into an almost dreamlike state of leaden unhappiness. I always thought we’d die together. My friends hated it when I said that. But they had husbands and children and grandchildren, and all I had was Bao. And now he is gone. I can’t imagine a life without him. I don’t want to imagine it. I think about how easy it would be to put an end to it, here on this deserted, winding mountain road. A sudden twist of the steering wheel, that’s all it needs. I have no unfinished business. My affairs are in order. Nobody will miss me. There’s nobody left to miss me. Yet here’s Bao, curled up in his usual place on the passenger seat. It doesn’t make sense, that he can be dead and also be here. I want to die, I want this awful pain to stop. But I can’t, not with Bao sitting here beside me. As the hours pass, I continue to be aware of his psychic presence. Looking back, I suspect that if someone else had been in the car with me, I might not have felt this presence so strongly. I might have tried to ignore it, or even allowed myself to be talked out of it. But I am alone, and I don’t want Bao to leave me. Now and then, I reach across to stroke his sleeping head, as I often do when we’re on the road like this. He is here, but he isn’t. I can accept this without understanding it. I’m glad I can accept it. But I’m also glad I don’t have to try to explain it to anyone else. Bao stays with me, and I am too exhausted to care if it is impossible or not. The sun moves across the cloudless sky, from east to west, and I drift. I feel as if I’m floating in space, suspended in time with invisible forces and impulses and energies humming all around me. There is no past and no future, only this present moment, this car moving along this road. Late that afternoon, I become aware that Bao is already a microscopic bundle of dividing cells in a womb. I can’t call it a vision, because it isn’t a vision. Nor is it a thought. It is more like a realization, something I hadn’t known a moment ago but know now. How is this possible? How is any of it possible? I find myself remembering the time my father brought home a crystal radio set. He let me watch while he set it up and then he showed me how to search for radio frequencies. I turned the dial as slowly and carefully as I could, but nothing happened. Then suddenly, I “got” something. I thought it was magic, until my father explained how crystal radios worked. That’s what I need now, I think. An explanation. I need someone to tell me how this works. Wittgenstein once said, All I know is what I have words for. Where, I wonder, are the words for this? Psychologist William James described mystical experiences as being ineffable, noetic, and transient. Is that what this is? Am I finally having an honest-to-goodness mystical experience? According to a National Opinion Research Center survey (Chicago, 1987) 43 percent of all Americans say they’ve had one. So why shouldn’t I? Yet I’m no mystic. I’m not even particularly spiritual. I’ve never thought of myself in those terms, and I still don’t. I’m more comfortable with the crystal radio analogy. Somehow, I’ve tuned in. The channels are open and the message is coming through. My terrible grief plus the solitude imposed by this long, monotonous journey have combined to create ... what? A mystical experience? Or a psychotic break? Again, I reach out to touch Bao and for a moment, I can literally feel his little head. But only for a moment. I drive on. The sun sinks lower in the sky. The silent knowledge that Bao is on his way back to me does not ease the pain, but it’s there, and it is strong as ever. I shake my head. None of it makes sense. And it hurts so much.